The fourth White Paper in our five-part series on social media measurement for ROI is now available for download. Co-authored by HootSuite and social media measurement coach, Nichole Kelly, this installment focuses on measuring the customer retention success of your social networks. Take a look, and be sure to circle back to the first three White Papers to learn how social media measurement can benefit your organization. The task of social media measurement is a challenging one for marketers. Many struggle to tie the new language of social metrics — like fans, followers, @replies, etc. — to metrics like sales, cost and revenue by which many traditional marketing channels report on success. It’s a common conundrum, which is why we have the latest White Paper in our five-part series available to help you out today. 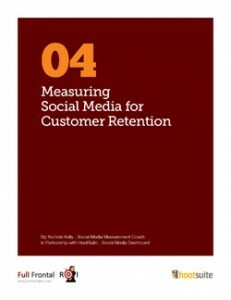 It’s a helpful guide to social media measurement for customer retention. Check it out for yourself (and share it too). 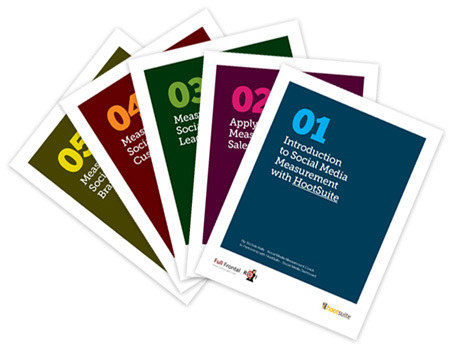 The first three White Papers in this series help round out the conversation on social media measurement — plus they’ve got helpful how-to’s for using the HootSuite dashboard to set up and gather social analytics on your campaigns. Have a read while you wait for the fifth and final installment on measuring social media for lead generation, which is set to be released in the beginning of July. White Paper co-author Nichole Kelly is a leading social media measurement coach and author of FullFrontalROI.com. After 12 years in corporate marketing creating accountable marketing teams, she used her talents to create a systematic way to measure social media and put it into the context of where it is delivering value to your organization and show bottom-line ROI. She has found that most marketers have the measurement tools they need and with the right language and the right strategy to put the pieces together; they can deliver results. HootSuite Pro and Enterprise plans are chock full of advanced tools and analytics to help take your social campaigns farther. Visit HootSuite.com/Pro or HootSuite.com/Enterprise to book a demo today.